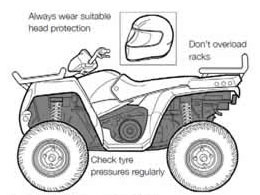 ATVs such as quad bikes and side-by-side utility vehicles are designed to cope with a wide variety of off-road conditions, but if used carelessly can very rapidly become unstable. Many quad bike fatalities in the UK have been caused by head injuries. Helmets would have prevented most, if not all, of these deaths. You should always wear a suitable helmet when riding a quad bike. The long seat on a quad bike allows operators to shift their body weight backwards and forwards for different slope conditions, a technique known as ‘active’ riding. It is not for carrying passengers. make sure all riders receive adequate training. Never carry a child as a passenger; it is illegal and will reduce your ability to control the ATV. Children under 13 years old are prohibited from using an ATV at work. Over-13s should only ride ATVs – of an appropriate size and power – after formal training on a low-power ATV. These vehicles have conventional sit-in seats with a steering wheel and pedals. They may have a second row of seats and usually have a rear cargo deck or bed allowing goods to be carried. Although the driver does not need to use active riding techniques to ensure stability the correct distribution of weight is still important. Always select a machine fitted with a Roll Over Protective Structure (ROPS). 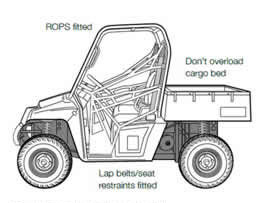 In addition to ROPS, the driver and passengers should wear lap belts/seat restraints to prevent them being thrown out in the event of an accident or overturn. The legal requirements for training are the same as for Quad bikes. Previous post: Worried about your hearing? Action Firearms Safety Training Inc.